Tom McCaslin has been described by Fanfare magazine as “one of the contemporary tuba virtuosos.” Originally from Regina, Saskatchewan, Tom’s playing and teaching have taken him around the globe. He has performed and taught in Canada, United States, Switzerland, Portugal, Finland, New Zealand and Australia. 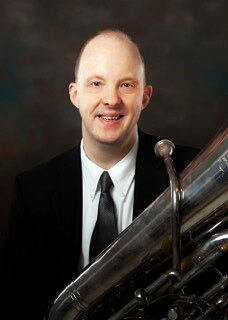 Tom is currently Principal Tuba of the Calgary Philharmonic Orchestra. As an orchestral musician he has performed with the Minnesota Orchestra, the Detroit Symphony, the Boston Symphony Orchestra, the North Carolina Symphony, the Regina Symphony, the Winnipeg Symphony, the New Mexico Symphony, the Orquestra Sinfónica do Porto Casa da Música (Portugal), the Lahti Symphony (Finland) and was acting Principal Tuba in the Auckland Philharmonia (New Zealand). In the summers he teaches at the Eastern Music Festival in Greensboro, NC, where he serves Principal Tuba with the EMF Festival Orchestra under the direction of Gerard Schwarz. As a soloist Mr. McCaslin’s solo recordings appear on the Crystal Records and Potenza Music labels. His first solo CD release, Inside Out, was met with much critical acclaim. The International Tuba and Euphonium Association Journal wrote, “Hopefully this CD will serve to inspire the “next generation” of young tubists who will hear and accept this as regular playing, and strive to push the limits even further.” Gramophone magazine wrote, “lf this recital doesn’t convert you to the lyricism of the tuba, nothing will.” Regarding his second CD release, One More Dance, Gramophone magazine wrote, “McCaslin’s technical abilities are brilliant and his musicianship is inspiring.” Tom has also recorded for the Canadian Broadcast Company, National Public Radio and performed on Prairie Home Companion with Garrison Keillor. He has performed at numerous International Tuba and Euphonium Conferences and at the United States Army Band Tuba and Euphonium Conference held in Washington, D.C.
Mr. McCaslin received degrees from McGill University and Arizona State University, with extensive study with legendary tubists John Griffiths, Fritz Kaenzig, Roger Bobo, Dennis Miller, and Samuel Pilafian. In 2003 he became the first tubist to return three summers to the prestigious Tanglewood Music Center, the summer training center for the Boston Symphony. Prior to joining the Calgary Philharmonic, Mr. McCaslin was Associate Professor of Tuba and Euphonium and Chair of the Instrumental Department at East Carolina University in Greenville, North Carolina. Tom McCaslin is a Yamaha Performing Artist and plays exclusively on Yamaha instruments.